In the field of technical analysis of modern communications signals, the ability to analyze the characteristics of demodulated signals with unknown codings is of major importance. In the field of technical analysis of modern communications signals, the ability to analyze the characteristics of demodulated signals with unknown codings is of major importance. In addition to various symbol stream/bitstream representations, R&S®CA250 provides a large number of powerful analysis algorithms and bitstream manipulation functions. By selectively using these tools, the user can obtain technical data from the unknown bit stream. This data provides information about the type and content of the analyzed signal. Ideally, it is possible to resolve all aspects of the unknown code, thereby allowing the user to program a specific decoder for the unknown signal (e.g. 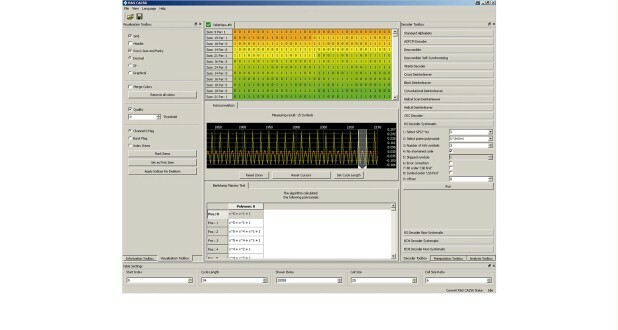 by using the R&S®GX400ID decoder development environment).